I'm not a fan of beef hamburgers. I know they are the quintessential all-American food, but I just don't care for beef. Sure, I'll eat it if it's the only thing served at a party, but I prefer pork, chicken or seafood over beef every day. We love to barbecue at our house and E normally makes a few hamburgers for the beef eaters who come to dinner. We always end up with more hamburger rolls than burgers, so I wondered if there was a burger I could make that I would eat. I remembered eating a chicken burger that was a spicy blend of sausage and chicken a few years ago, so I decided to try to make my own version. I used fresh Mexican chorizo (Primio brand). Chorizo comes in two styles: fresh and smoked. The smoked variety is firm and doesn't need to be cooked. The fresh variety is soft like uncooked Italian sausage. 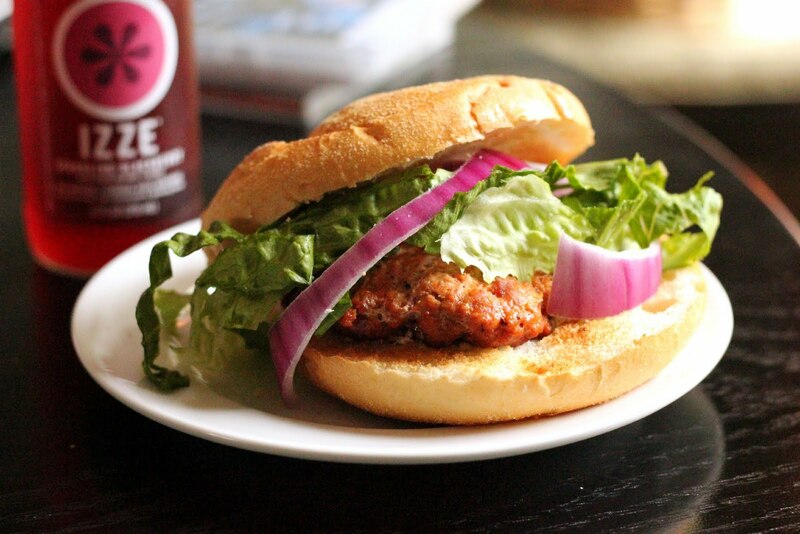 The fresh was the best choice for this burger because the spicy, fatty sausage blends well with the lean chicken. The result is a spicy, sausage-like burger that's not to greasy and it's lightened up by the chicken. I make my burgers about 3/4 inch thick and 5 inches in diameter with a sight indent in the middle. The indentation keeps the burgers wide and flat when the middle puffs up during the grilling process. These burgers only take a few minutes to form and you can park them in the fridge until you're ready to grill them. I even made extra burgers and froze them for future barbecues. In a large bowl, mix all ingredients by hand. Divide mixture into four equal portions and form into burger patties. Grill over medium-high heat for about four minutes per side, or until burgers are cooked through. Serve on a fresh roll with lettuce, tomato, red onion or other toppings of your choice. oh, how I wish I had a grill! I'll take a burger any way I can get it and these look delicious!